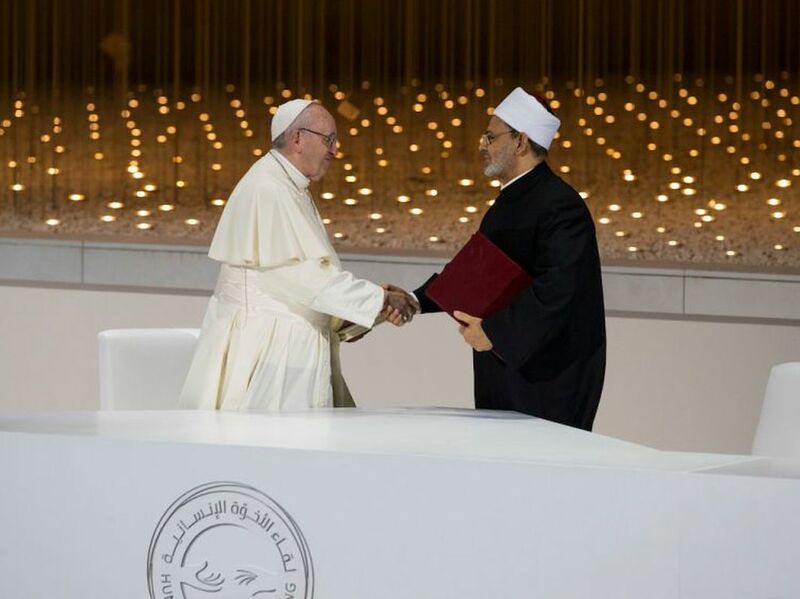 Pope Francis and the Grand Imam Dr. Ahmed At-Tayyeb, Grand Imam of Al Azhar, signed a historic joint declaration with their hopes for world peace and human co-existence in Abu Dhabi in the presence of HH Sheikh Mohammed bin Rashid and HH Sheikh Mohamed bin Zayed on Monday night. Entitled the Human Fraternity Document, the document pledges that al-Azhar and the Vatican will work together to fight extremism, claiming to be in the name of “all victims of wars, persecution and injustice”, and warns against a “third world war being fought piecemeal”. “We resolutely declare that religions must never incite war, hateful attitudes, hostility and extremism, nor must they incite violence or the shedding of blood,” the document says. In the first ever papal visit to the Arabian peninsula, Pope Francis delivered a speech to an interfaith gathering of imams, muftis, ministers, rabbis, swamis, Zoroastrians, and Sikhs, promoting fraternity and peace. “Every form of violence must be condemned without hesitation, because we gravely profane God’s name when we use it to justify hatred and violence against a brother or sister. No violence can be justified in the name of religion,” he stated. Sheikh Tayeb, who addressed the pope as “my dear brother”, called on Muslims in the Middle East to “embrace” local Christian communities. “Continue to embrace your brothers the Christian citizens everywhere, for they are our partners in our nation,” he said. During the event, HH Sheikh Mohammed bin Rashid also announced the launch of “The Human Fraternity Award – Dar Zayed,” which was presented to Pope Francis and the Grand Imam. On Tuesday morning, Pope Francis will hold an open-air mass for 135,000 Catholics at the Emirate’s Zayed Sports City Stadium.